Precipitation was below average, coming in at 2.72", which is 1.34" below normal and ranks as the 40th driest since 1895. Fortunately, rainfall was distributed across each week, thus despite the dry conditions in a month that is traditionally prone to forest and brush fires, not too many blazes erupted. The year to date has seen an average of 11.94" of rain and melted snow fall over NJ. This is 2.69" below average and ranks as the 28th driest start of the past 119 years. The 3-month total of 9.02" was the 30th driest and 2.13" below average. The past six months have been the 46th driest (19.14") and the past 12 months 69th driest (or 50th wettest; 46.18"). Thus reservoir levels are near average, while short-term streamflow and groundwater levels are somewhat below average. Returning to April, west central and far southern areas were wettest, with Franklin Township (Hunterdon County) topping the list at 3.50", Frenchtown (Hunterdon) next at 3.41", Blairstown (Warren) 3.38", Middle Township (Cape May) 3.31", and Wildwood Crest (Cape May) 3.27". It is notable that all of these totals are below the normal statewide April average. Bergen County in the northeast was home to the driest five April totals. Palisades Park received 1.08", Wood Ridge 1.41", Saddle Brook 1.48", North Arlington 1.51", and Glen Rock 1.52". The first notable rainfall of the month occurred in Cape May County on the morning of the 5th, with 1.13" falling in Sea Isle City, 1.11" in Middle Township, and 1.07" at Wildwood Crest. Totals gradually decreased to the northwest, with no rain falling north of Monmouth and Burlington counties. Even with a little of this rain falling in the Pinelands, a 150-acre fire burned in a remote section of Wharton State Forest on the 6th-7th. That weekend saw approximately 40 other fires in central and northern NJ, though cumulatively, not more than 30 acres burned. Dry and increasingly warm conditions over the next several days led to a brush fire near the Lombardi rest stop at the north end of the NJ Turnpike on the 9th. The evening of the 10th into the early hours of the 11th saw drenching thunderstorms over much of NJ, the first significant outbreak of 2013. All but the extreme south received at least several tenths of an inch, with over 0.50" falling from Mercer, Middlesex, and Monmouth counties northward. Frenchtown (Hunterdon) received 1.33", Kingwood (Hunterdon) 1.15", and four CoCoRaHS stations in Blairstown (Warren) observing 1.19", 1.12", 1.11", and 1.11". Another bout of rain occurred from the predawn hours of the 12th through predawn of the 13th. The entire state received at least several tenths, the most falling from Salem and western Cumberland counties northeastward to Monmouth, where generally 1.00"-1.50" was measured. The least rain fell in the far southeast and far northwest. Washington Township (Gloucester) caught 2.00", two Berlin (Camden) stations had 1.88" and 1.72", and 1.63" fell in Medford Township (Burlington). Scattered showers and thundershowers on the afternoon of the 19th into the morning of the 20th resulted in a complex pattern of precipitation across the state. The northwest and southern quarter received 0.75"-1.00", while the least (several tenths) fell from the northeast into central areas, down into the Pinelands, and eastward to the northern coast. Two Franklin Township (Hunterdon) stations caught the most with 1.51" and 1.28, followed by Frenchtown (Hunterdon) 1.30" and Alexandria Township (Hunterdon) 1.28". The last notable April rainfall occurred from the early hours of the 29th to predawn on the 30th. Much as the month started, the heaviest rain was in the southeast, with 1.26" at Wildwood Crest and 1.21" in Middle Township and Stone Harbor, all in Cape May County. Only a few tenths fell over the remainder of southern and central NJ, with under a tenth across the northern quarter of the state. Accumulating snow was not observed in April, and assuming none will fall in May, the 2012-2013 snow season concluded with a state average of 20.8" falling. This makes the season the 72nd snowiest of the past 119 seasons, coming in at 4.1" below average. The northern third of the state average 32.4" (2.2" below average and 63rd snowiest), the central area 24.7" (4.1" below average and 68th snowiest), and the southern third 12.7" (7.1" below average and 86th snowiest). There were 17 snowfall events from early November to late March where one or more locations in the state received 2.0" or more of the white stuff. The majority of these events were not particularly heavy, although three of them resulted in accumulations exceeding 10.0" in at least several locations. This includes the exceptional event on November 7-8 where locations in Monmouth and Ocean counties caught more than 10", including 13.0" at Freehold (Monmouth), right on the heels of Sandy. The largest storm of the season occurred on February 8-9, with eight counties catching more than 10.0" (Bergen, Essex, Hudson, Monmouth, Morris, Passaic, Sussex and Union), topped by 16.8" in River Vale (Bergen). March 7-8 saw Highland Lakes (Sussex) receive 11.8" and at least 10.0" falling in higher elevations of Bergen, Morris, Passaic, and Sussex counties. NJ residents had endured a rather chilly March, thus the first 70° day of 2013 was welcomed on the 4th by those in the southern half of the state. Those in the north would have to wait another five days for every area to top the 70° mark. There were nine April days when at least one of the 54 NJ Weather and Climate Network stations equaled or exceeded 75°. Mansfield (Burlington) hit 75° on the 4th. Red Lion (Burlington) at 80° on the 8th was the first to reach that threshold. Four other stations came in at 79° that day. 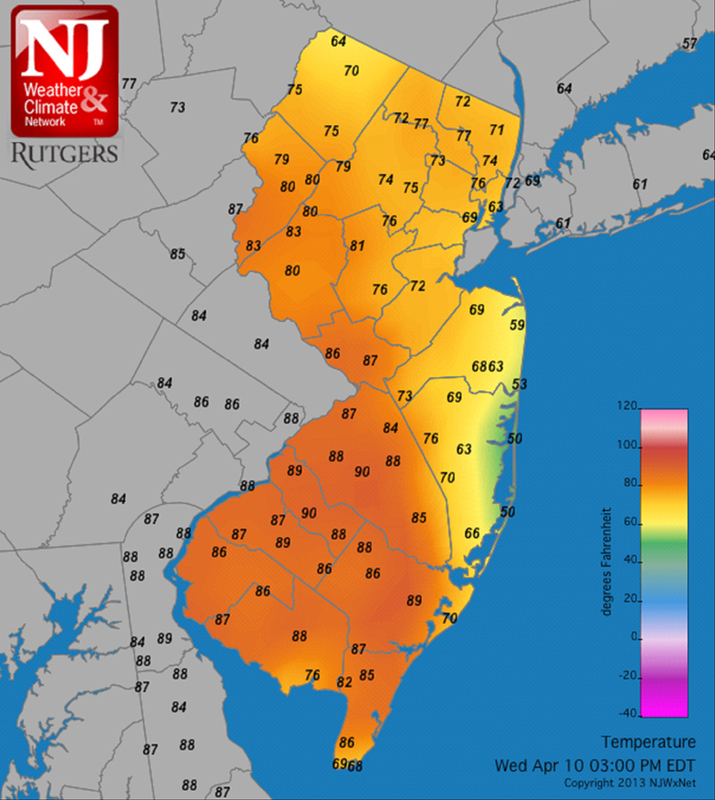 On the 9th, 49 stations topped out between 80°-86°, the warmest location being Egg Harbor (Atlantic) at 86°. High Point Monument (Sussex) at 72° was the coolest of the five stations in the 70°s. The 10th saw an enormous range of afternoon temperatures across NJ. Sicklerville (Camden) reached 91° and Egg Harbor, Red Lion, Oswego Lake (Burlington), and Cherry Hill (Camden) 90°. 29 stations were between 80°-89°, while Seaside Heights (Ocean) and High Point Monument only made it to 67°. Once a significant sea breeze kicked in the thermometer fell to 50° at Seaside Heights at 3PM while it was 90° just 30 miles to the west in Sicklerville! Some warmth lingered following the thunderstorms later on the 10th such that Upper Deerfield and Greenwich, both in Cumberland County, made it to 81° on the 11th. The thermometer rose to 75° in Clayton (Salem) and Red Lion (Burlington) on the 16th, followed by this same value in Dennis Township (Cape May) and Hamilton (Mercer) on the 17th. Red Lion, Hillsborough (Somerset), and Hamilton reached 80° on the 19th. Basking Ridge (Somerset) topped out at 77° on the 24th, with four stations at 75°. On the chilly side of the ledger, low temperatures were at or below freezing at one or more locations on 16 April days. Six days saw a location fall to 25° or colder. The first of these days was the 2nd, when cold air drainage resulted in the valley locations of Walpack (Sussex) dropping to 18° and Pequest (Warren) 20°. On the 3rd, Pequest reached 21° and Kingwood (Hunterdon) 22°. The coldest morning of the month was the 4th, with 53 of the 54 NJWxNet stations dropping to 32° or colder. Only West Cape May (Cape May) at 34° escaped a freeze, and was the only station remaining above freezing throughout April. Walpack chilled to 18° and Pequest 20° on the 4th. High Point Monument was 24° on the 6th and Berkeley Township (Somerset) 25° on the 7th. The 21st saw Walpack fall to 24° and 20 other NJWxNet stations drop below freezing. March's eleven days with winds gusting to 40 mph or greater at one or more NJ stations was almost equaled by ten such April days. The first four days of April saw maximum gusts at High Point Monument of 43, 41, 48, and 42 mph, respectively. Seaside Heights reached 40 mph on the 1st and Sea Girt (Monmouth) 40 mph on the 3rd. High Point Monument reached 41 mph on the 6th. Wantage hit 44 mph on the 9th and High Point Monument 42 mph. Storms on the 10th brought gusts of 49 mph to Point Pleasant (Ocean), 47 mph to Wantage, and 40-42 mph gusts at four other locations. Kingwood (Hunterdon) had a 44 mph gust on the 12th. The 19th was the windiest day of April, with Upper Deerfield (Cumberland) topping out at 58 mph, Stewartsville (Warren) 53 mph, and four stations reaching 40-48 mph. Finally, a 55 mph gust was observed at High Point Monument and 46 mph at Wantage on the 25th. The highest pressure of the month (and thus far 2013) occurred on the 22nd, with most barometers close to 30.65". Both the 1st and 19th saw the month's lowest pressure, each day close to 29.60".